Hankook have been selected for another original fitment covering both summer and winter tyres, this time for the third-generation X3 which was introduced last year. The two tyres that will be available are the Ventus S1 evo² SUV in size 225/60 R18 104 W XL and with Hankook's winter i*cept evo² SUV in 225/60 R18 104 H XL. BMW Group required Hankook's engineers to develop a tyre that offers a high performance without compromising comfort for the summer tyre in particular, in keeping with the brand's sporty reputation and also matching the comfortable yet agile character of the BMW X3. The Ventus S1 evo² SUV wearing the BMW OE 'star' marking has been fitted with specially adapted bead filler. This is designed for more sporty vehicles and offers the necessary rigidity to guarantee high steering precision that does justice to the vehicle's driving dynamics and still gently cushions the increased weight of an SUV. TO be able to cope with the high temperatures the Ventus S1 evo² SUV is exposed to driving at approved speeds of up to 270km/h and the reinforced layers are made of a specially developed heat-resistant hybrid textile. The high rigidity of the lower sidewall also achieves particularly good handling characteristics. The winter tyres homologated by BMW were also designed to optimise the X3's driving dynamics. Development work focused particularly on good track performance as well as on low rolling resistance. By minimising block movement and wear, 3D sipes applied to the entire tread area ensure additional driving stability as well as improving the general handling properties with the aid of maximised edge effects. A highly dispersible nano-silica compound is used, which prevents hardening of the tyre at low temperatures and thus ensures better grip on wintery and wet roads through greater elasticity of the tyre contact area, as shown by the short braking distances. "the fact that our summer and winter tyres are now being used as original equipment not only for the BMW 7 Series but also for the BMW X3 is a testament to the engineering performance of our tyre developers and proof of the high quality of our products" says Tony Lee, vice-president marketing and sales at Hannkook Tire Europe. "Hankook's investment in its own winter testing ground 'Technotrac' in Ivalo, Finland, which provides us with a very good basis for the development of winter tyres for original fitment as well, is certainly paying off on the European market with is a very important market for us." From this autumn Yokohama will begin European sales of its all-season tyre "BluEarth-4S AW21. 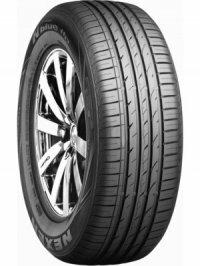 This will be the first all-season passenger-car tyre Yokohama has introduced to the European market. The tyre will be available in over 30 sizes, ranging from 255/R19 107W to 175/65R14 82T and they plan to gradually expand the line-up of available tyre sizes. The "BluEarth-4S AW21" incorporates their latest winter-tyre technologies to provide drivers with outstanding performance on icy and snowy winter roads as well as excellent dry and wet performance under more normal driving conditions. Will also feature a newly developed tread pattern that features an optimal balance of edge area and surface contact area. The use of several advanced technologies, such as Divergent V-grooves and Crossing Narrow Grooves, deliver superior performance on ice, snow and wet road surfaces. In addition to its wide tread width, the tyre's large shoulder blocks and all-season sipes deliver reliable performance on dry roads as well. The tyre's use of silica end-locked polymer compound also enhances its performance on wet and snow-covered roads. In addition, its wide and flat profiles contribute to its excellent dry performance and wear resistance. The tyre also bears the "Snowflake Mark" awarded by the ASTM International in recognition of its performance in the most severe cold climates. After intensive testing on the Nürburgring Nordschleife in Germany and on Porsche's proving ground in Nardò in Italy, Porsche has approved Dunlop Sport Maxx Race 2 as original equipment for the new 911 GT3 RS in the sizes 265/35ZR20 (99Y) XL and 325/30ZR21 (108Y) XL. Both tyres are N1 marked. The Sport Maxx Race 2 has been developed together with Porsche to meet the exceptional performance requirements for its new 911 GT3 RS: excellent performance on dry surfaces and delivering ultimate track lap time for dedicated performance drivers. Dunlop engineers worked on an evolution of both design and compound to provide extra-grip and performance. "The Sport Maxx Race 2 is an excellent match for our 911 GT3 RS, in terms of dry performance, grip and steering precision. Dunlop's demonstrated quality and their capability to understand and implement our requirements are the key to success," said Jan Frank, Porsche Motorsport Lead Development Engineer. "Dunlop equipped the first 991 GT3 with the Sport Maxx Race in 2013, and since then we have been able to build a strong tradition with Porsche GT family and homologated our tyres for each and every model." said Nick Harley, Managing Director OE Consumer EMEA. In which case, it's time to dust off the caravan/motorhome and classic car ready for what we all hope will be a great summer ahead - certainly after this winter! Remember that these vehicles have been sat idle for months on end and more often than not, routed to the spot. It's during these fallow periods that tyres can really suffer from ultra violet light degradation and flat spotting - certainly the older they are. Tyres have a shelf life, and they also have a useable life in terms of age. For infrequently used vehicles such as caravans, this should ideally be no more than 6 years from date of manufacture (which is stamped on every tyre). This risk of failure rapidly increase at this point irrespective of how much tread they have left. Tyres are made from an organic product - rubber. This ages and becomes more brittle. Don't leave it to chance when you're off on a break. Check and replace if in doubt. There's no hassle with our friendly mobile service! We bring everything to you - wherever you are and have a vast range of tyres available for all applications. We're also experience TYRON™ band installers too. We're looking forward to looking after you! Falken's AZENIS FK510 has received more awards in Germany's prestigious 2018 summer test. The FK510 has received the top spot in German motoring magazine ACE Lenkrad's trial, alongside receiving a 'Highly Recommended' rating in Auto Zeitung's summer tyre text. The Advanced 4D NANO design process has revolutionised Falken's approach and enabled its tyres to now challenge the performance of the premium brands. Ace Lenkrad's test revealed the FK510 fitted to a VW Passat size 235/45R18 delivered the fastest time against ten competitors around the dry handling course, a wet braking distance of less than 4q metres, extremely low drive-by noise and low rolling resistance to claim the top spot. Auto Zeitung's test, used a SEAT Leon SC 1.4 TSI ACT, in full braking from 100 km/h on a wet track, the FK510 came to a standstill in only 50 metres, just 0.6m behind the highest-scoring tyre, leading the respected magazine to state "In the wet, Michelin, Continental and Falken drive in a league of their own." Performance wasn't just restricted to the wet, in the dry Auto Zeitun claimed "The FK510's cornering was very swift and stable, even during rapid lane changes." In ACE Lenkrad's "Environment/Economy" test category, the outstanding technical characteristics of the Falken AZENIS FK510 helped it to score 137 points out of a possible 170. As the fourth lowest priced tyre in the tests, the FK510 also demonstrated consumers choosing mid-range tyres need not compromise on performance and safety. Michelin have launched the Agilis Crossclimate for light commercial vehicles for safe driving in all weather conditions. The new Agilis CrossClimate is boasting safety in all weathers, high mileage, robustness, damage resistance and long lasting performance. The fitment is 3PMSF (Three Peak Mountain Snowflake) winter certified for use on snowy roads, and also performs well on muddy and grassy surfaces, ideal for the range of surfaces UK vans travel on. The all-year mobility has been achieved by a rugged tread pattern, manufactured with innovative new rubber compounds to promote flexibility in cold temperatures and sidewall and shoulder protection features for improved robustness in service. Jonathan Layton, Michelin's Head of Fleet in the UK and Ireland, says: "The Agilis CrossClimate solves the problem of wintry conditions bringing a van or light truck fleet to its knees in the UK and Ireland. It also eradicates the expense of buying different sets of winter and summer tyres - which, given the relatively mild climate across the great swathes of the country in winter, can be an unwanted outlay for fleet managers. This is a highly capable tyre that can handle the demands of safe driving on wintry surfaces, mud and grass, but still behaves, brakes and boasts the long lasting performance of Michelin's summer tyre range on dry and wet roads." The premium tyre maker Hankook is now also providing original fitment tyres for the new Audi RS 4 Avant, this has a powerful V6 bi-turbo engine, which now has 600Nm torque and weighs 80kg less than its predecessor and is bound to live up to the expectations of sports car drivers. Permanent all-wheel drive in combination with 19 or 20 inch tyres on all wheels guarantees the necessary traction and power required for accelerating from 0 to 100 km/h in 4.1 seconds. The first vehicles were delivered at the beginning of the year are being fitted with Hankook Ventus S1 evo² with noise-absorbing "sound absorber®" technology in 265/35R19 98Y XL (Standard) or 275/30R20 97Y XL (optional). Hankook Ventus S1 evo² provide very sporty handling to match the Audi RS 4 Avant. Hankook engineers have made sure that comfort and durability have not been neglected despite the focus on high grip and precise handling. Hankook's flagship tyre was able to demonstrate not only its sportiness, but its durability, comfort and safety too. Short braking distances and an above-average performance in the wet were achieved through the advanced styrene-polymer-silica mixture used for the tread. In addition, the multiple tread radius technology and lightweight rayon carcass always guarantee optimum tread contact for the best possible contact with the road during operation. The innovative DTM inspired 3-layer block design with its special staircase arrangement of the outer rib blocks thus ensures consistently high grip even as the tyre wear progresses, thereby guaranteeing very good traction and braking performance throughout the entire lifetime of the tyre. Volkswagen have selected Falken as original equipment manufacturer (OEM) for the sixth-generation VW Polo. Falken will be supplying its premium tyre models AZENIS FK453, SINCERA 838A ECORUN, ZIEX ZE914A EC and the winter tyre HS449 for factory fitting. "The range and attributes of our tyres complement the broad requirements of the VW Polo. From tyres for drives seeking a sporting ride through to tyres for drivers whose priorities are energy efficiency and mileage, we will deliver tyres to suit every application." comments Christian Stolting, Key Account Manager OE at Falken Tyre Europe GmbH. The Falken FK453 has delighted sporty drivers with the ultra-high-performance tyre also succeeding in convincing the test teams at german motoring magazine Auto Zeitung. The FK453 has been praised for its top performance in agility, braking and high speed in wet conditions on the test circuit, rating the tyre 'Highly Recommended'. How Long Should You Keep Your Winter Tyres Fitted? Our first full-on wintry blast for 2017-18 across the UK hit mid December. The severity was mixed, with the Midlands being hit hardest. Arguably this came quite early as recent history has tended to hit us with adverse weather much later in the winter months. It wasn't too long ago that snow fell in early April shortly before record high temperatures were recorded later in the same month! Already we've had a number of clients over the country booking us to replace their summer tyres back on over the coming days. The consideration being that as temperatures appear to be settling above 7C more often than not, that they will prematurely wear the winter tyres out if left fitted. While winter tyres work best at 7C and below, they will still provide excellent grip and braking safety at temperatures above this point. Weather in the UK can change rapidly, as we all know, and it's most often these times that catch out motorists unexpectedly. Our advice is to keep winter tyres fitted until at least mid-March and possibly longer the further north you live in the UK. Unless you are an exceptionally high mileage user, the benefits far outweigh any potential small increase in wear rate. Unsure whether you should still consider fitting winter tyres mid way through winter? Consider one of the increasing range of All Season type tyres we have available. Offering performance in ALL weather conditions year round, these tyres don't need to be swapped over at all. Call us for more information. The New Year brings a busy start across the Hometyre network! The recent bad weather and low temperatures has given rise to an increase in the number of potholes in the roads - causing considerable tyre damage and punctures. For Hometyre clients though, a quick call to the team and their car is soon made roadworthy while they carry on with their working (or relaxing) day. 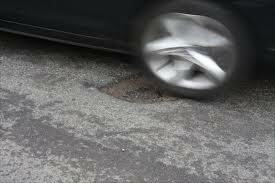 A sudden deflation after a pothole strike will often signal bad signs for your tyres future. Sidewalls get pinched and rip apart in severe cases. Even if nothing appears to go wrong though, it's vitally important that you check, or have someone check your tyre(s) for damage. Sometimes an impact can damage the internal components of your tyre and cause a large bulge to appear on the sidewall (inner or outer). Left unattended, this will eventually blow out fully and often catastrophically. Don't leave it to chance. Tra la la la laaaaa la la laaa laaaaa. It's got a ring to it...? On a serious note though, with all the fuss and panic over Christmas shopping, food shopping and planning, planning planning etc, it's really easy to neglect your car at this time of year. With the shorter and colder days here too, we're all less likely to wash the car or bother to check it over before a journey. At this time of year, your tyres are super important. Low tread means low grip, poor steering and poor braking - all things you really don't want to suffer out on the roads. Did you know that in every tyre there are little blocks in the grooved area of the tread? These blocks (called TDIs Tread Depth Indicators) are preset at 2mm, which is the lowest point you should run your tyres to. If any part of the tyre is flush with one of these blocks, it's time to replace. Easy! And remember, if you're busy, we bring the entire fitting centre directly to you, wherever you are and at spcific times of day to suit. With low prices and ultimate convenience - make sure that travelling this winter is safe and surefooted. 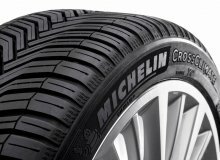 After extensive independent testing by Auto Express Michelin's CrossClimate+ has been named as the best all-season tyre. The publication tested eight all-season tyres and concluded that the CrossClimate+ was 'best suited to UK conditions'. 'In Wet braking it needed 1.5 metres less than the next best,' the report said, while in the dry it 'took more than four metres less to stop' than the nearest competitor. It was the quickest by almost two seconds around the handling track where 'it was precise, required much less lock and let us get on the accelerator earlier and harder'. Jamie McWhir, car and 4X4 technical manager for Michelin in the UK, said: "We're really pleased with these results. When the CrossClimate was launched more than two years ago we knew it was an ideal tyre for the UK, where winters tend to be wet with only occasional snow." "The CrossClimate+ has gone even further across a whole range of performance criteria, which means there is no need to compromise in either the summer or the winter - and it delivers safety and comfort right down to the minimum legal tread depth of 1.6mm. It's testament to our commitment to research and development and we're very proud of it." National Tyre Safety Month continues with TyreSafe reminding drivers to not rely solely on tyre pressure monitoring systems (TPMS). While this valued technology has been proven to improve road safety by advising of a change in tyre pressure, drivers need t check their TPMS is working and be aware that is does not warn drivers of the condition of their tyres. While typically reliable the system can fail and batteries in the wheel-mounted sensors can run out. All new cars sold are now fitted with TPMS as mandatory. To check it's working, drivers need to ensure the TPMS symbol comes on with all the other warning lights when the ignition key is turned and goes out after the engine starts. Stuart Jackson, Chairman of TyreSafe, said "The introduction of TPMS was a valuable step forward in tyre safety but drivers should be more aware of it and the warnings it is capable of producing. Tyre Safety Month is the ideal time to learn exactly what is does so you don't rely on it to warn you of defects it simply cannot detect. Don't have a Bad Air Day double-check your TPMS system is working as it should." Hometyre offer TPMS checks, can advise on battery life and can replace fully systems or service parts. If you're already accustomed to making the seasonal switch from summer tyres to winter tyres then it's time to plan ahead and book us in during October. If the weather turns abruptly, it can get pretty busy very quickly! A cold weather tyre performs best at 7C and below. The design and composition of the tread and rubber means that unlike a summer tyre which hardens at lower temperatures, these tyres remain supple and grippy throughout. The tread blocks (sipes) act like a centipedes legs, forcing there way onto the road surface in wet /slushy and even in snowy conditions. Braking distances are massively improved, as is cornering stability. All very positive attributes for winter driving. There's also now the uprise of the All Season tyre too. These tyres offer good year round capabilities - a kind of jack of all weathers - but master of none! A great option for the urban motorist who is unlikely to suffer serious extremes. National tyre safety month kicks off with the question "Are you having a Good or Bad Air Day?" A study conducted by TyreSafe suggests as many as 57% of car and van tyres on the roads are being driven below recommended inflation pressures, increasing vehicles' fuel consuption and the risk of being involved in an incident. Not only does the vehilce become more difficult to control, the amount of tyre in contact with the road can be halved. If it isn't touching the road properly, a tyre's grip is compromised, meaning it takes longer to stop, espcially in the wet. A tyre can wear 10% more quickly if it's 10% below the manufacturer's recommended settings and the extra effort needed to turn the wheels means the vehicle burns more fuel. Research by TyreSafe shows an extra £600 million is potentially being spent on fuel bills by drivers because their tyres are under-inflateds. It's also adding the amount of CO2 the vehicle burns. To reduce the risks while driving and save themselves money, drivers are reminded to check their air pressures at least once a month and before long journeys. Stuart Jackson, Chairman of TyreSafe, said "Keeping tyres properly inflated is easy to do, keeps drivers and other road users safe, and saves money. It's a win-win situation so it's remarkable how many motorists don't ensure the pressures are correct for the vehicle and the load it is carrying. Tyre Safety Month is the ideal time to start the routine of ensuring every driving day is a good air day." Vehicles typically have two tyre pressure settings. These will need to be adjusted depending on whether the vehicle is fully loaded or has a light load. Most vehicles have these displayed either in the fuel filler cap, door shut or even glovebox, but the will certainly be in the owner's handbook. Leading global tyre manufacturer Nexen Tire has announced that it will be expanding its original equipment tyre supplies in the European market. The Nexen N'blue HD Plus will be Supplied as OE tyres o a number of European carmakers, including Škoda, Volkswagen and SEAT. The new upgraded Volkswagen Polo, a compact hatchback and one of Volkswagen's best-selling models will be fitted the N'ble HD Plus in size 215/45R17 95W. They will also be fitting this in sizes 205/60R16 92V and 215/60R16 95V on the new compact SUV Volkswagen's T-Roc. The N'blue HD Plus will also be fitted to the SEAT Ibiza in the size 215/45R17 91W in addition to SEAT's first SUV Ateca in the size 215/60R16 95V. "We are proud that our products satisfy the requirements of global carmakers in Europe," said Nexen Tire. "Nexen Tire will contiue to expand its presence in the global market through its commitment to innovation and quality. Hometyre supply and fit the full range of Nexen tyres for car, 4x4, and light commercial vehicles. Call today for more information. New area goes 'live' September 20th! 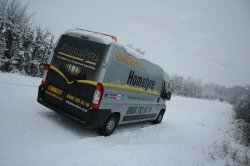 Hometyre have further extended UK coverage to now include a large part of Norfolk too. Concentrating within the areas between Norwich and Thetford, the local team are now ready to repair and replace tyres with the same dedication, enthusiasm and service as is available elsewhere across the UK. Falken is expanding its winter tyre portfolio with the new EUROWINTER HS01 SUV. Like the EUROWINTER HS01, the SUV models have been developed using state-of-the-art technology to deliver top directional stability, superb aquaplaning resistance and excellent grip in wet, icy and snowy conditions. "A winter tyre specifically for SUVs is the logical continuation of our strategy of supplying an extensive product portfolio for growing and profitable market sectors," says Andreas Giese, Senior Manager Division Corporate Planning at Falekn Tyre Europe GmbH. "We have also expanded the EUROWINTER HS01 and EUROWINTER VAN01 rages by adding more sizes; there are now 77 new car sizes and 17 light truck and van sizes. This will boost our market coverage in these sectors." The EUROWINTER HS)! SUV is now available in 12 sizes, with a further 27 to be added to the catalogue in 2018. Falken will supply the EUROWINTER HS01 SUV in rim diameters 16 to 19 inches, in series 55 to 70 and in speed rating H, V and W.
All Season or Winter Tyres for 2017/18? Are you starting to think about the (sorry!) forthcoming winter? If you're a regular winter tyre user, at some point in October you'll no doubt be making the switch back off your summer rubber in preparation for the cold season. Tyre manufacturers have recognised that across Europe - and particularly in the UK, the winter season has changed. Prolonged sub zero temperatures and extreme weather appears to have been replaced by a colder version of August! While there is no real substitute for proper cold weather tyres to handle true wintry conditions on untreated and less well used roads, there is certainly a good case for a tyre that can be kept on year round and offer a good range of capabilities. Enter the ALL SEASON tyre. Many manufacturers now have a range of all season offerings across popular sizes. These tyres bridge the gap between a summer and winter tyre and provide a level of performance in both seasons without particularly compromising on wear rates, comfort, noise or fuel economy. These probably represent a great alternative for urban motorists who wish to retain the peace of mind and surefootedness of a winter tyre at low temperatures without the need for biannual swap overs and tyre storage associated with true winter options. Of course if the weather does deteriorate to conditions that we last experienced back in 2011, or you rely on your vehicle daily, for whatever reason, then the investment in a full set of winter tyres will prove invaluable. Whatever your preference, we're happy to offer our best advice and a range of options to suit. Our mobile service allows you to swap over summer to winter tyres at home - saving you the cost of storage facilities (provided you've got a little space to keep them, of course). Hometyre are preferred suppliers of arguably the finest winter tyres available - NOKIAN. Manufactured in Scandinavia, Nokian invented and have continuously developed this product over many decades. Call us for more information. From their invention of winter tyres in 1934 Nokian Tyres have continued to lead the way with a full range of car, van & 4x4 tyre and bring safe, innovative, high performance winter products to the global market. 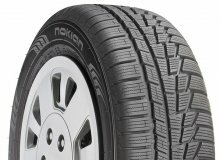 A completely new portfolio of products for 2017 from Nokian Tyres include the WRD4, WRA4 and the Nokian Weatherproof, the first year round tyre carrying the 3PMSF taking All Season, Beyond All Seasons. Nokian Tyres have created a unique innovation in their SUV products with an Aramid Sidewalls, increasing reliability and durability by implementing staple Aramid fibres to the sidewall which are also used in military and aerospace applications. 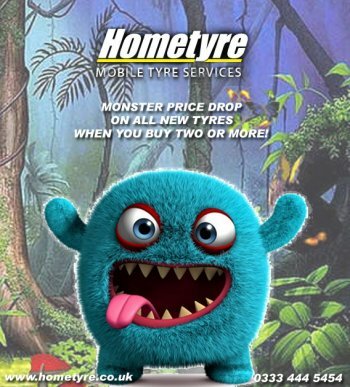 Hometyre are an authorised UK dealer and fit the full range of Nokian tyres for car, 4x4, and light commercial vehicles. Call today for more information.